Mersea is a small island located in the Blackwater and Colne estuaries, Essex. 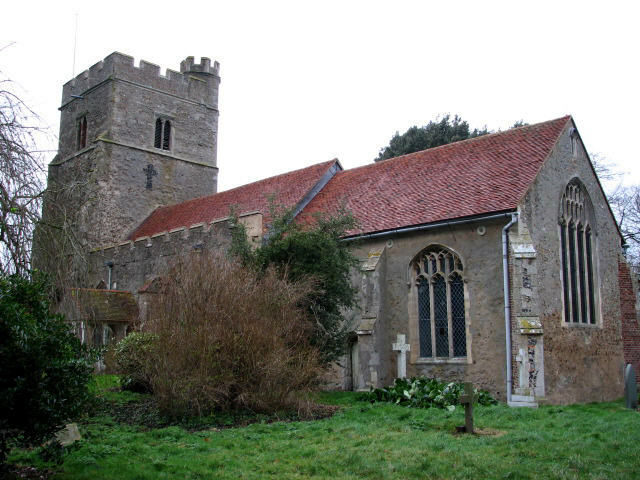 On the east side of the island lays The Church of St Edmund King and Martyr, parts of which date back to the twelfth century. One of the more curious stories attached to the church is the grave of Sarah Wrench (1833-1848), by the North wall of the chancel at St. Edmund's Church which is unusual for an English grave because it is covered by a mortsafe. Sarah Wrench’s grave position and mortsafe is still shrouded in mystery and to this day has lots of people asking the same questions who was she and why is there an iron cage on her grave? Sarah was born in West Bergholt, 1833, to Robert and Elizabeth Wrinch (often spelt as Wrench). Records show she was baptised on 25th December 1833 and died on the 6th May 1848. She was buried in the grounds of The Church of St Edmund King and Martyr on 10th May 1848. She was buried on the north side of the grounds, the side often left unconsecrated, where criminals and suicides were buried. Records show that she was neither. Add to this the fact that a mortsafe was installed around her grave (a device commonly added in the early 1800s to deter grave robbers from exhuming fresh corpses) and the mystery deepens. While the risk of a grave being disturbed was very real during the early years of the nineteenth century, the passing of the The Anatomy Act of 1832 (meaning that practitioners of surgery could now legally obtain corpses for study) meant that the need for a mortsafe after this date was obsolete. Yet the grave of Sarah Wrench, buried some sixteen years after the passing of the act, was surrounded by such a device. So, why the need for the mortsafe? Tuberculosis?, though highly infectious, claimed many lives during the nineteenth century, yet there was no requirement for victims of the disease to be buried in graves that were further secured by the addition of a mortsafe, else there would be many more graves like those of Sarah Wrench, post The Anatomy Act of 1832, littering the UK’s graveyards. This is not the case. Hearsay at the time hinted at a fear of Sarah, shared by the community; It is claimed that in life she was so feared that locals felt compelled to place an iron cage over her to stop her leaving the grave and troubling East Mersea residents. There are allusions to Sarah Wrench being a witch (at least according to local folklore), but while there were instances of witch trails in the area, they ceased in practice during the late 1700s, and while superstition dies hard, there is no formal evidence to suggest that Sarah Wrench was a practitioner of what the Parish would have termed ‘witchcraft’. Other theories suggest that her internment on the north side of the cemetery was due to the fact that she was either pregnant or had given birth to a child outside of wedlock, both circumstances frowned upon by the church. However, the north side of the graveyard was not always completely unconsecrated. Depending on the needs of the family of the deceased, a plot could be blessed before burial. Records show that other members of Sarah’s family (The Croyden's – her mother’s maiden name) were buried on the same side of the cemetery, as was a former churchwarden. However, the mystery as to the uniqueness of Sarah’s grave remains, and the person/s responsible for both the placement of the plaque and the mortsafe are unknown, as is their reasoning behind such an act.